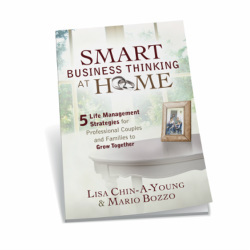 Lisa Chin-A-Young & Mario Bozzo are Co-Founders of Smart Business Thinking At Home and The Marriage Development Company that reapply business strategies to home life. Together, they have over 40 years experience in the corporate world internationally building and leading great teams. They started applying business frameworks to their home life early on in their marriage and it has become a key part of happily managing life at home, strategically and operationally. Friends and colleagues were curious and intrigued to learn more about how they could improve communication, planning, and decision-making at home and encouraged them to share their approach. 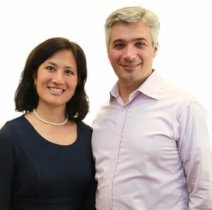 Their 5 Life Management Strategies have been described as intelligent, thought-provoking, and inspiring creating a “light bulb” moment for many couples who wonder why they haven’t been doing this before! Lisa has a B. Sc. Engineering from Queen’s University in Canada and a MBA from INSEAD in France and Singapore and has worked at leading international companies including Procter & Gamble and Monitor strategy consulting. Mario has a Bachelor of Environmental Studies from University of Waterloo in Canada and a M.Sc. from University of Leeds in the UK and is a Director at IBI Group. They live with their family in London, England.